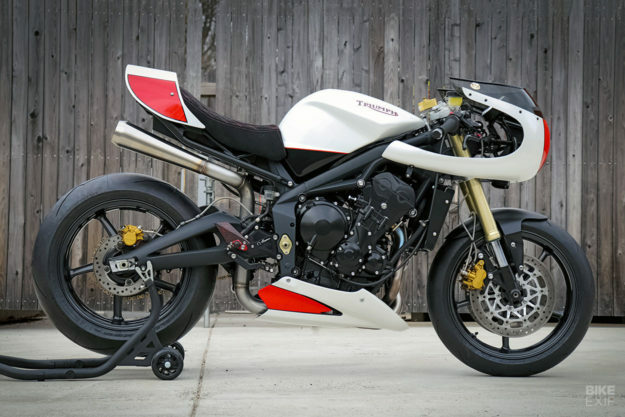 For riders of a sporting persuasion, the first-generation Street Triple is close to the ideal motorcycle. It’s light and handles beautifully, and the 106 hp engine is an absolute peach. We love the iconic twin headlights that came with that model, but some folks don’t. 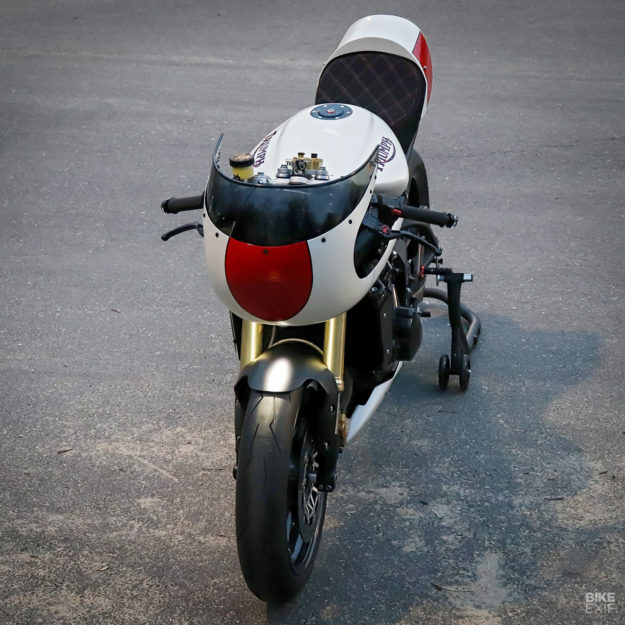 If you’re not a fan, there’s inspiration right here for a custom job—courtesy of Jett Design and Motorelic of Virginia, USA. 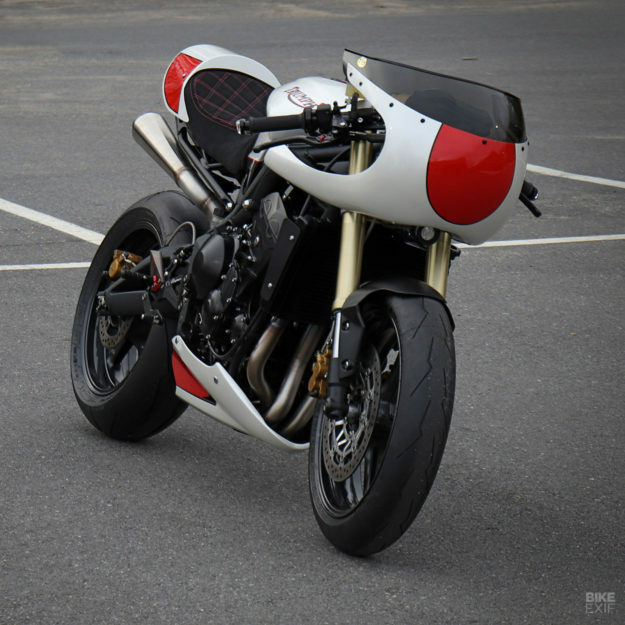 Andrew Jett describes this Street Triple as a “lightweight race-inspired build, paying homage to the endurance racers of the 70s and 80s.” And there’s an additional fillip in the paint scheme, inspired by the slinky Porsche 908 racecars from the late 60s. 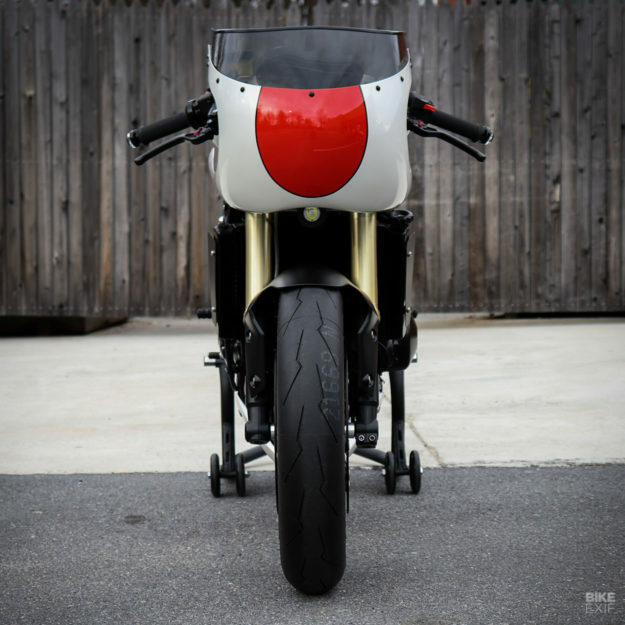 Andrew designed the bike, with Motorelic’s Sean Skinner helping out with the building process. Together, they’ve updated the chassis with the best suspension and go-fast parts, to boost the overall performance package. The 675 motor is very sound in factory spec, so Andrew left the internals alone. Instead, he’s treated the bike to a complete new exhaust system, a BMC air filter, and a remap to extract the maximum from both. 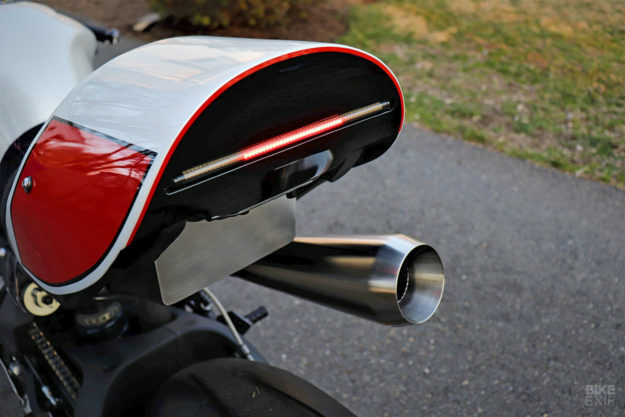 The factory baffle is gone from the air intake, for maximum airflow. Power feeds through a Yoyodyne slipper clutch more aggressive downshifting. A lightweight 520 chain runs over Superlite sprockets, and there’s a 49-tooth rear sprocket—two teeth up from the factory 47-tooth sprocket. An APE timing chain tensioner is used, chosen for its bulletproof qualities over the factory spring-style tensioner. 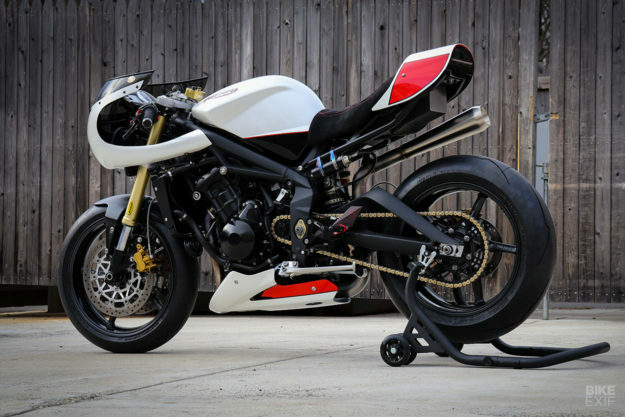 The Street Triple has sweet handling straight out of the box, but Andrew has upgraded the suspension regardless. There are K-Tech 20 IDS cartridges in the forks, giving 30 clicks of rebound damping on one leg, 24 clicks of compression damping on the other leg, and 18mm of spring preload adjustment. The rear shock is now a multi-adjustable Penske 8900 remote shock, which lifts the ride height at the back. “It’s raised by 8mm to shift slightly more weight over the front axle and give a faster turn-in response,” Andrew reports. The clip-ons are adjustable Woodcraft items, with black hard-grip Renthal grips and a Scotts steering damper system to aid stability. 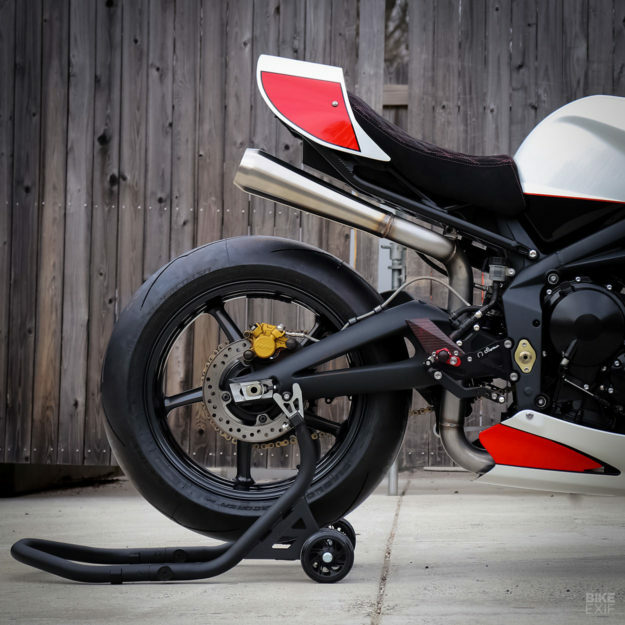 The controversial bug-eyed look of the stock Street Triple is gone, thanks to the fiberglass front fairing, which is shaped and cut to fit the narrow Street Triple frame tightly. 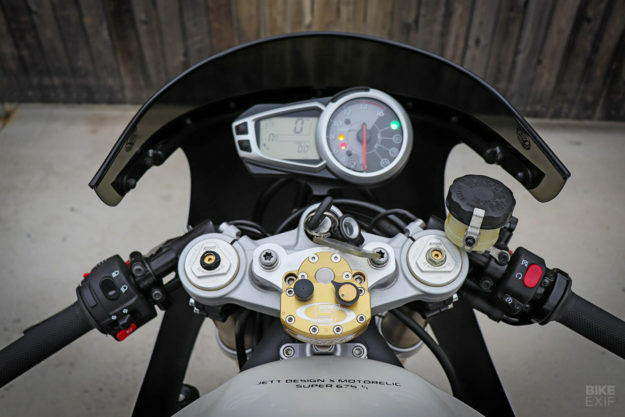 For the windscreen, Andrew modified a Gustafsson Plastics item and then cut and lowered the gauge cluster mount to fit. 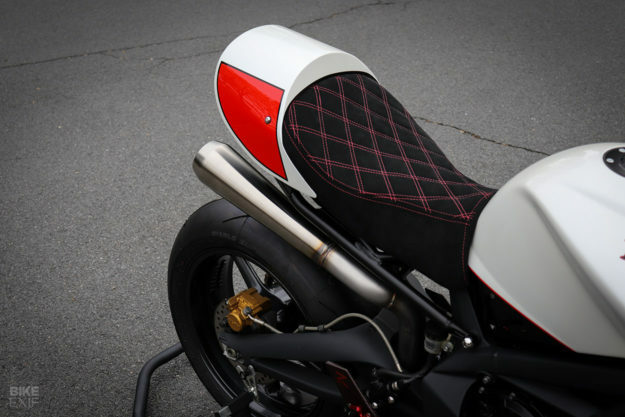 The seat is highly modified from a stock seat, and was wrapped in diamond stitched black Alcantara by Lims Upholstery. 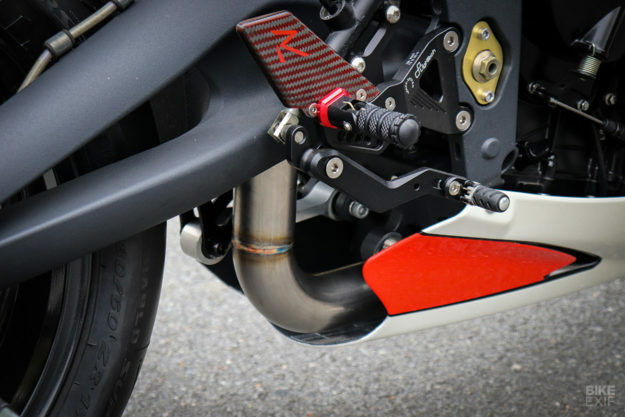 Underneath is a new aluminum subframe, weighing just 2.5 pounds (1.1 kg), built by Andrew and Motorelic, and finished off in satin black powder coat. Inspiration for the simple yet delicious paint was very specific: the #5 and #64 Porsche 908 coupes, which raced at tracks such as Monza and Le Mans in 1969. “I love the red and white scheme, and the 908 has always been one of my personal favorite race cars,” says Andrew. The rod and custom specialist Petittbilt in Virginia shot the paint. 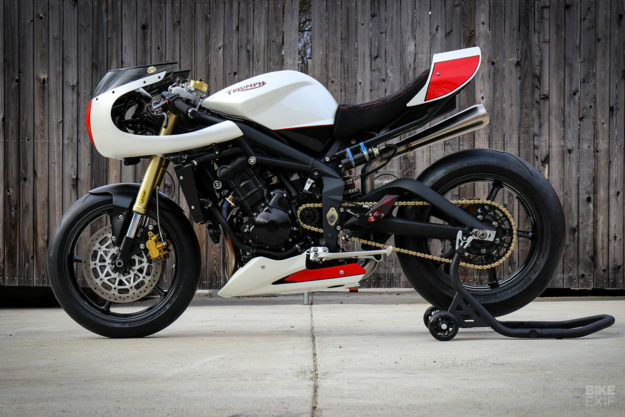 In the US, a good condition first-generation Street Triple can be yours for less than $5,000 these days. Which must be one of the greatest smiles-per-dollar bargains in the motorcycling world. Anyone else tempted to give Andrew and Sean a call?